Though a part of New York City, Brooklyn maintains a character of its own. Brooklyn is characterized by cultural diversity, an independent art scene, distinct neighborhoods, and a unique architectural heritage. The Dutch were the first Europeans to settle the area on the western edge of Long Island, which was then largely inhabited by the Canarsie Native American tribe. The first Dutch settlement was Midwout (Midwood), established in 1634., The Dutch also purchased land in the 1630s from the Mohawks around present day Gowanus, Red Hook, the Brooklyn Navy Yard, and Bushwick. The Village of Breuckelen was authorized by the Dutch West India Company in 1646 and became the first municipality in what is now New York State. At the time Breuckelen was part of New Netherland. The Dutch lost Breuckelen in the British conquest of New Netherland in 1664. In 1683, the British reorganized the Province of New York into 12 counties, each of which was sub-divided into towns. Over time, the name evolved from Breuckelen, to Brockland, Brocklin, Brookline, and eventually Brooklyn. Kings County was one of the original 12 counties, and Brooklyn was one of the original six towns within Kings County. The county was named in honor of King Charles II of England. In August and September 1776, the Battle of Long Island (occasionally now called, anachronistically, the "Battle of Brooklyn") was fought in Kings County. It was the first major battle in the American Revolutionary War following the Declaration of Independence, and the largest battle of the entire conflict. New York, and Brooklyn along with it, gained independence from the British with the Treaty of Paris in 1783. The first half of the nineteenth century saw urban areas grow along the economically strategic East River waterfront, across from New York City. The county had two cities: the City of Brooklyn and the City of Williamsburgh. Brooklyn annexed Williamsburgh in 1854. It took until 1896 for Brooklyn to annex all other parts of Kings County. The building of rail links such as the Brighton Beach Line in 1878 heralded explosive growth, and in the space of a decade the City of Brooklyn annexed the Town of New Lots in 1886, the Town of Flatbush, the Town of Gravesend, and the Town of New Utrecht in 1894, and the Town of Flatlands in 1896. 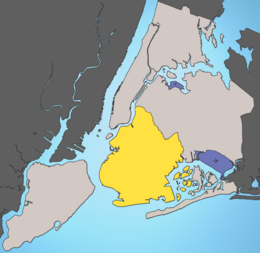 Brooklyn had now reached its natural municipal boundaries at the ends of Kings County. The question was now whether it was prepared to engage in the still-grander process of consolidation now developing throughout the region. In 1898, Brooklyn residents voted by a slight majority to join with Manhattan, The Bronx, Queens, and Richmond (later Staten Island) as the five boroughs to form modern New York City. Kings County retained its status as one of New York State's counties. Brooklyn is located on the westernmost point of Long Island and shares its only land boundary with Queens to the northeast. The westernmost section of this boundary is defined by Newtown Creek, which flows into the East River. Brooklyn's waterfront faces different bodies of water. Northern Brooklyn's coast is defined by the East River, while middle Brooklyn adjoins New York Bay. This area of the waterfront features the Red Hook peninsula and the Erie Basin. Buttermilk Channel separates this part of the waterfront from Governors Island. Southwest is Gowanus Bay, connected to the Gowanus Canal. At its south westernmost section, Brooklyn is separated from Staten Island by the Narrows, where Upper and Lower New York Bay meet. Brooklyn's southern coast includes the peninsula on which stretch Coney Island, Brighton Beach, and Manhattan Beach. The southeastern coast lies on island-dotted Jamaica Bay. The highest point in Brooklyn is the area around Prospect Park and Green-Wood Cemetery, rising approximately 200 feet (60 m) above sea level. There is also a minor elevation in Downtown Brooklyn known as Brooklyn Heights. Brooklyn has many well-defined neighborhoods, many of which developed from distinct towns and villages that date back to its founding in the Dutch colonial era in the early 1600s. Today, Downtown Brooklyn is the third-largest central business district in New York City, after Midtown Manhattan and Lower Manhattan It has many commercial towers and a rapidly increasing number of residential buildings. The northwestern neighborhoods between the Brooklyn Bridge and Prospect Park, including Boerum Hill, Brooklyn Heights, Carroll Gardens, Cobble Hill, Clinton Hill, Vinegar Hill, DUMBO (an acronym for "Down Under the Manhattan Bridge Overpass"), Fort Greene, Gowanus, Park Slope, Prospect Heights, and Red Hook, are characterized by many nineteenth century brick townhouses and brownstones. These neighborhoods include some of the most gentrified and affluent neighborhoods in Brooklyn, along with ample subway lines, cultural institutions, and high-end restaurants. Further North along the East River lie Williamsburg and Greenpoint. Traditionally working class communities with a vibrant cultural mix, many artists and hipsters have moved into the area since the late 1990s. Further changing the area, the city completed an extensive rezoning of the Brooklyn waterfront in 2005 which will allow for many new residential condominiums. As prices have risen, redevelopment has moved eastward away from the waterfront into Bushwick along the "L" subway line. 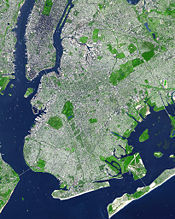 Central and southern Brooklyn contain many more architecturally and culturally distinct neighborhoods, some of which grew rapidly in the late nineteenth and early twentieth century as upwardly-mobile immigrants moved out of tenement buildings in Manhattan neighborhoods like the Lower East Side. Borough Park is largely Orthodox Jewish; Bedford-Stuyvesant is the largest black neighborhood in the country; Bensonhurst is historically Italian. Dyker Heights is an affluent Italian neighborhood. East Flatbush and Fort Greene is home to a large number of middle-class black professionals. Brighton Beach is home to many Russians. Since 1990, Brooklyn has seen a rise in new immigration to neighborhoods like Sunset Park, home to flourishing Mexican and Chinese American communities. 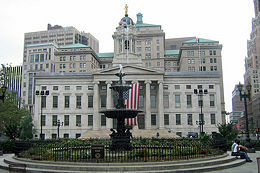 The office of Borough President was created in the consolidation of 1898 to balance centralization with local authority. Each borough president had a powerful administrative role derived from having a vote on the New York City Board of Estimate, which was responsible for creating and approving the city's budget and proposals for land use. In 1989, the Supreme Court of the United States declared the Board of Estimate unconstitutional on the grounds that Brooklyn, the most populous borough, had no greater effective representation on the Board than Staten Island, the least populous borough, a violation of the Fourteenth Amendment's Equal Protection Clause pursuant to the high court's 1964 "one man, one vote" decision. Since 1990 the Borough President has acted as an advocate for the borough at the mayoral agencies, the City Council, the New York state government, and corporations. Currently, Brooklyn's Borough President is Marty Markowitz, elected as a Democrat in 2001 and re-elected in 2005. The Democratic Party holds the majority of public offices. Of registered voters in Brooklyn, 69.7 percent are Democrats. Party platforms center on affordable housing, education and economic development. The most controversial political issue is over the proposed Brooklyn Nets Arena, a large development project. Pockets of Republican influence exist in Bay Ridge and Dyker Heights. Each of the city's five counties (coterminous with each borough) has its own criminal court system and District Attorney, the chief public prosecutor who is directly elected by popular vote. Charles J. Hynes, a Democrat, has been the District Attorney of Kings County since 1989. Brooklyn has 16 City Council members, the largest number of any of the five boroughs. It also has 18 administrative districts, each served by a local Community Board. Community Boards are representative bodies that field complaints and serve as advocates for local residents. Brooklyn has not voted for a Republican in a national presidential election in the last 50 years. In the 2004 presidential election Democrat John Kerry received 74.9 percent of the vote in Brooklyn and Republican George W. Bush received 24.3 percent. Brooklyn's official motto is Een Draght Mackt Maght. Written in the (old) Dutch language, it is inspired by the motto of the United Dutch Provinces and translated as In Unity There is Strength. The motto is displayed on the borough seal and flag, which also feature a young robed woman bearing fasces, a traditional emblem of republicanism. Brooklyn's official colors are blue and gold. 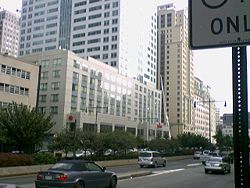 Downtown Brooklyn is the third largest business district in New York City. Brooklyn's job market is driven by three main factors: the performance of the national and city economy, population flows, and the borough's position as a convenient "back office" for New York's businesses. Forty-four percent of Brooklyn's employed population, or 410,000 people, work in the borough; more than half of the borough's residents work outside its boundaries. As a result, economic conditions in Manhattan are important to the borough's job seekers. Strong international immigration to Brooklyn generates jobs in services, retailing and construction. In recent years Brooklyn has benefited from a steady influx of financial back office operations from Manhattan, the rapid growth of a high-tech/entertainment economy in DUMBO, and strong growth in support services such as accounting, personal supply agencies and computer services firms. Jobs in the borough have traditionally been concentrated in manufacturing, but since 1975, Brooklyn has shifted from a manufacturing-based economy to a service-based economy. In 2004, 215,000 Brooklyn residents worked in the services sector, while 27,500 worked in manufacturing. Although manufacturing has declined, a substantial base has remained in apparel and niche manufacturing concerns such as furniture, fabricated metals, and food products. The pharmaceutical company Pfizer has a manufacturing plant in Brooklyn that employs 990 workers. Construction and services are the fastest growing sectors. Most employers in Brooklyn are small businesses. In 2000, 91 percent of the approximately 38,704 business establishments in Brooklyn had fewer than 20 employees. The unemployment rate in Brooklyn in March 2006 was 5.9 percent. Education in Brooklyn is provided by a vast number of public and private institutions. Public schools in the borough are managed by the New York City Department of Education, the largest public school system in the United States. Private schools range from the elite Berkeley Carroll School to religious schools run by Roman Catholic Diocese of Brooklyn and Jewish organizations. The Satmar Jewish community of Brooklyn operates its own network of schools, which is the fourth largest school system in New York state. Brooklyn College is a senior college of the City University of New York, and was the first public co-ed liberal arts college in New York City. The College ranked in the top 10 nationally for the second consecutive year in Princeton Review 2006 guidebook, America’s Best Value Colleges. Many of its students are first and second generation immigrants. The Brooklyn College campus serves as home to the Brooklyn Center for the Performing Arts complex and its four theaters, including the George Gershwin. Brooklyn Law School was founded in 1901 and is notable for its diverse student body. Women and African Americans were enrolled in 1909. According to the Leiter Report, a compendium of law school rankings published by Brian Leiter, Brooklyn Law School places 31st nationally for quality of students. Kingsborough Community College is a junior college in the City University of New York system, located in Manhattan Beach. SUNY Downstate Medical Center, originally founded as the Long Island College Hospital in 1860, is the oldest hospital-based medical school in the United States. The Medical Center comprises the College of Medicine, College of Health Related Professions, College of Nursing, University Hospital of Brooklyn, and the School of Graduate Studies, where Nobel Prize-winner Dr. Robert F. Furchgott is a member of the faculty. The College of Medicine has the highest percentage of minority students of any medical school in New York State. Long Island University is a private university in Downtown Brooklyn with 6,417 undergraduate students. 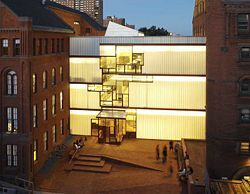 In Clinton Hill, the Pratt Institute is one of the leading art schools in the United States and offers programs in art, architecture, fashion design, design, creative writing, library science, and other area disciplines. As an independent system, separate from the New York City and Queens libraries, the Brooklyn Public Library offers thousands of public programs, millions of books, and use of more than 850 free Internet-accessible computers. It also has books and periodicals in all the major languages spoken in Brooklyn, including Chinese, Russian, Spanish, Hebrew, and Haitian Kreyol, as well as French, Yiddish, Hindi, Bengali, Polish, Italian, and Arabic. The Central Library is a landmarked building facing Grand Army Plaza and is undergoing extensive renovations and an underground expansion. There are 58 library branches, placing one within a half mile of each Brooklyn resident. There's a significant business library in Brooklyn Heights. The Library is preparing to construct the new Visual and Performing Arts Library, which will focus on the link between new and emerging arts and technology and house traditional and digital collections. It will provide access and training to arts applications and technologies not widely available to the public. The collections will include the subjects of art, theater, dance, music, film, photography and architecture. A special archive will house the records and history of Brooklyn's arts communities. Brooklyn has a culture rich in history and tradition. It is a borough that has influenced many works of art, such as television, movies, music, paintings, literary works, and sports. The Brooklyn Museum, opened in 1897, is among the world's premier art institutions with a permanent collection that includes more than 1.5 million objects, from ancient Egyptian masterpieces to contemporary art. The Brooklyn Academy of Music (BAM), is a complex including the 2,109-seat Howard Gilman Opera House, the 874-seat Harvey Lichtenstein Theater, and the art house BAM Rose Cinemas. Founded in 1863, the Brooklyn Historical Society (BHS) is a museum, library, and educational center dedicated to preserving and encouraging the study of Brooklyn's 400-year past, while reflecting upon the future of the culturally rich borough. BHS houses a treasure trove of materials relating to the founding of the U.S. and the history of Brooklyn and its people. Brooklyn has played a major role in American letters. Walt Whitman wrote of the Brooklyn waterfront in his classic poem Crossing Brooklyn Ferry. Betty Smith's 1943 book A Tree Grows In Brooklyn, and the 1945 film based on it, are among the best-known early works about life in Brooklyn. William Styron's novel Sophie's Choice is set in Flatbush, just off Prospect Park, during the summer of 1947. Arthur Miller's 1955 play A View From the Bridge is set in Brooklyn. Movies and television have also used Brooklyn as their setting and their inspiration, as in the case of two famous movies from the 1970s. Dog Day Afternoon was based on a real-life botched bank robbery in 1972 which turned into a 12-hour circus and ended with the arrest of the main characters. 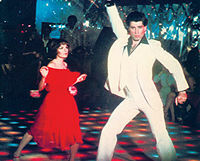 Saturday Night Fever used Bay Ridge in Brooklyn as its setting, where the lifestyle of young Brooklynites in the late 1970s was characterized at the height of the disco explosion, which immortalized that great era. Television shows, such as The Honeymooners in the 1950s and Welcome Back Kotter in the 1970s are set in a Brooklyn apartment building in the Bushwick section and a high school named James Buchanan High in Bensonhurst, respectively. Many famous actors are originally from the borough, including both Al Pacino and Robert DeNiro. Two of Brooklyn's most famous icons are the Brooklyn Bridge and the Brooklyn Dodgers, today known as the Los Angeles Dodgers. 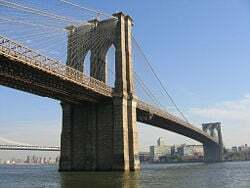 The Brooklyn Bridge was the first suspension bridge to be built across the East River to facilitate transportation into Lower Manhattan. Opened in 1883, the bridge initially carried trolleys but by 1943, it was transporting cars as well as pedestrians and bicyclists. The bridge has graced many pictures over the years, a symbol representing the Lower Manhattan skyline and recognized throughout the world. In their hey-day, the Brooklyn Dodgers attained fame and recognition from fans as well as non-sports fans alike. Known notoriously as "dem bums," the Dodgers, who played at Ebbets Field in the Flatbush area of Brooklyn, made history with many of the games in the regular season against the New York Giants, and especially in the post-season, where they played against the New York Yankees on many occasions. These games are referred to as the "subway series." They helped break the color barrier in 1947 when Jackie Robinson wore a Dodger uniform for the first time. The Brooklyn Dodgers won their only World Series championship in 1955 by defeating the Yankees, becoming heroes among their fellow Brooklynites. Economic change and political desire for change caused the Dodgers to move to Los Angeles by the end of the 1957 season, causing resentment and pain to the many fans that idolized their team. Although the Dodgers left at the end of 1957, international soccer was still played at Ebbets Field, but in 1960, the once home to the Brooklyn Dodgers was demolished, giving way for the construction of the Ebbets Field Apartments complex. ↑ Kings County, New York, factfinder.census.gov. Retrieved December 4, 2007. ↑ "Population, Housing Units, Area, and Density: 2000". factfinder.census.gov. Retrieved December 4, 2007. ↑ Edward Robb Ellis. The Epic of New York City. (Carroll & Graf, 2004), 53. ↑ Vine, David. Billions for Brooklyn—No Questions Asked:The Borough’s New Power Brokers, Winter 2003. www.thebrooklynrail.org Retrieved December 4,2007. ↑ Cornell Law School Supreme Court Collection: Board of Estimate of City of New York v. Morris. www.law.cornell.edu. Retrieved December 4, 2007. ↑ Borough of Brooklyn. blue and gold. www.brooklyn-usa.org. Retrieved December 4, 2007. ↑ U.S. Census Bureau, 2001 County Business Patterns. . www.bedc.org. Retrieved December 4, 2007. ↑ Andy Newman.Rabbi Moses Teitelbaum Is Dead at 91. www.nytimes.com. Retrieved December 4, 2007. ↑ Leiter's Law School Rankings leiterrankings.com. Retrieved December 4, 2007. Official site of the Brooklyn Borough President. www.brooklyn-usa.org. BBT/School of Russian Ballet at Kingsborough. www.brightonballet.org. Mark Morris Dance Group. markmorrisdancegroup.org. This page was last modified on 6 July 2016, at 22:36.